We’d love your help to keep the momentum going. As always, we aspire to keep our calendar full, and it’s our intention to do so as long as the doors to 951 Chung King Road remain open. We hope that you will support the PRB by making a year-end tax-deductible donation. In addition, we’ve brought on new curators to keep our programming fresh and informally ranging, and we’ve initiated new collaborations with existing organizations such as ALOUD at the Central Library and the Villa Aurora artist residency. We also provide a working space for other artist and activist run projects like the Reader’s Chorus and The Public School. We have several exciting things planned for 2018, including our ongoing busy schedule at Chung King Road, and an expansion and formalization of our extensive chapbook and magazine archive. Your contribution gives us the opportunity to continue to provide a space for free and open readings and performances, new publications, and support for traveling writers. Any size contribution is welcome. The book is based on the idea of words being medicine - taking us into spaces of dissolution and re-emergence. Amanda and Harold have had an ongoing collaboration also thinking about how we literally ingest/digest language to create unexpected personal transformations, spark our intuitive genius, and embody surprising antidotes to tyranny. The Nine Herbs Charm Collective (Saewon Oh, Eric Kim Hannah Mjolsnes) – conducting a plant ceremony for an herbal antidote. Nine Herbs Charm consists of Hannah Mjølsnes, Eric Kim, Saewon Oh and the nine plants described in an Old English poem first recorded in the 11th century. They perform ceremonies and create environments for encounters with these plants, whose history is closely interconnected with our own. Eric Heep leading The Reader's Chorus – performing a newly written score based on text from the book! The Reader’s Chorus is made up of LA composers, musicians, visual artists, filmmakers, writers and poets. Inspired by the possibilities of a group of speaking voices we write for, experiment with, and perform the sound of reading. Joseph Mosconi is a writer and taxonomist based in Los Angeles. He co-directs the Poetic Research Bureau and co-edits the art & lit mag Area Sneaks. He is the author of Fright Catalog, Demon Miso/Fashion In Child, and other books. Writing has appeared in Triple Canopy, The Third Rail, Fillip, Material Press, Best Experimental American Writing and other journals. Sam Cohen's fiction can be found or is forthcoming in Fence, Gulf Coast, Black Clock, Two Serious Ladies, Pank, and other journals, and as a chapbook on Birds of Lace. She is working on a PhD in Creative Writing and Literature at the University of Southern California and is the founder of the online journal Yes Femmes. Amanda Ackerman’s publications include the Book of Feral Flora, Unfo Burns a Million Dollars, and the scented pamphlet Air Kissing. Her work focuses largely on the feralscape, divining techniques that allow for communication across species boundaries. With Dan Richert, she is working on a series of projects using biofeedback and multi-sensory techniques that allow plants to create poems. Their olfactory installation Unknown Giants is currently part of The Laboratory for Aesthetics and Ecology’s A New We in Norway’s Kuntshall Trondheim gallery. With Harold Abramowitz, she co-edits the press eohippus labs. Harold Abramowitz's books include Blind Spot, Not Blessed, Dear Dearly Departed, and UNFO Burns A Million Dollars. Harold co-edits the short-form literary press eohippus labs, and writes and edits as part of the collaborative projects, SAM OR SAMANTHA YAMS and UNFO. He teaches in the Department of General Studies at Charles R. Drew University in Los Angeles. Man’s Wars and Wickedness is a high drama set in “the healthiest region in all Europe.” A county of rolling hills and crooning cherry trees. A land irrevocably shaped by the great war in its past, its future. Herein lies the drama… Virtuosic, Man’s Wars and Wickedness swerves between narrative voices and forms, offering the reader a rash of mysteries to explore: who is the true bad guy? Is the world really ending? What language can I trust? 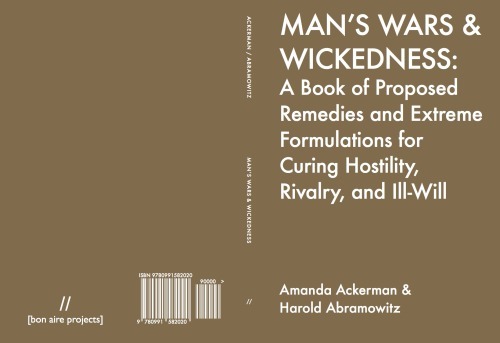 In this sense, Man’s Wars and Wickedness is a necessary book for our times. 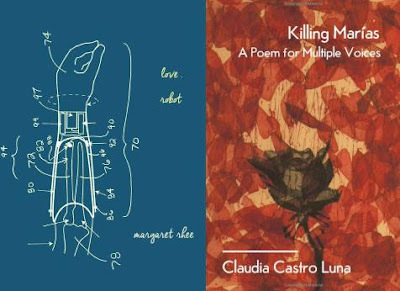 Through readings of robots, bodies, violence and love, a celebration and invocation of two new debut poetry collections by Margaret Rhee and Claudia Castro Luna. Readers include Lucy Burns, Mark Marino, Sean Pessin, Jessica Ceballos y Campbell and SA Smythe. Salvadorean and Korean food, along with poetry cake provided. Plus wine. Love, Robot (The Operating System, 2017) by Margaret Rhee is a collection of love poetry that humanizes our relationship with technology. This vision of an artificially intelligent future reveals and questions the contours of the human, and how robots and humans fall in and out of love. Claudia Castro Luna served as Seattle’s first Civic Poet from 2015-201 and is the author of This City (Floating Bridge Press). She is a Hedgebrook and VONA alumna, the recipient of a King County 4Culture grant and a Jack Straw Fellow. Born in El Salvador she came to the United States in 1981. 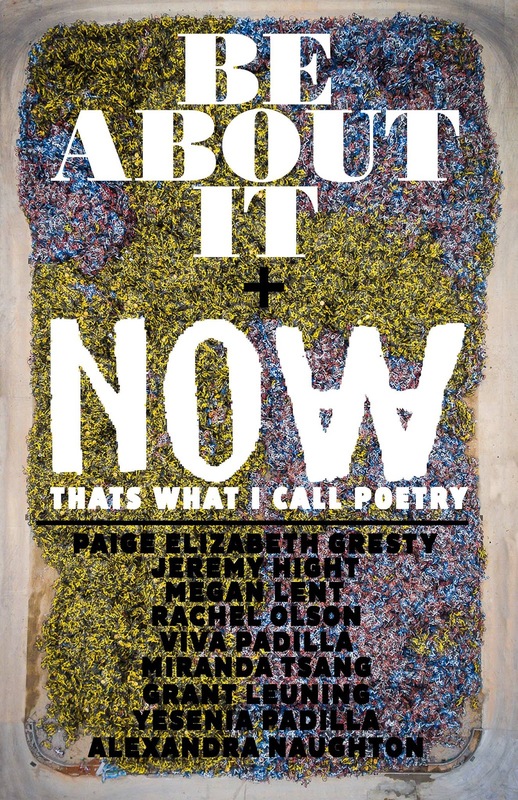 Her poems have appeared in Poetry Northwest, La Bloga, City Arts and Taos Journal of International Poetry and Art, among others. Her non-fiction work can be read in the anthologies, The Wandering Song: Central American Writing in the US, (Northwestern University Press); Vanishing Points: Contemporary Salvadoran Narrative, (Kalina Eds) and forthcoming in This Is The Place: Women Writing About Home (Seal Press). Living in English and Spanish, Claudia writes and teaches in Seattle where she gardens and keeps chickens with her husband and their three children. Margaret Rhee is a poet, artist, and scholar. She is the author of chapbooks Yellow (Tinfish Press, 2011) and Radio Heart; or, How Robots Fall Out of Love (Finishing Line Press, 2015), nominated for a 2017 Elgin Award, Science Fiction Poetry Association. Her project The Kimchi Poetry Machine was selected for the Electronic Literature Collection Volume 3. Literary fellowships include Kundiman, Hedgebrook, and the Kathy Acker Fellowship. She received her Ph.D. from UC Berkeley in ethnic and new media studies. Currently, she is a Visiting Scholar at the NYU A/P/A Institute, and a Visiting Assistant Professor at SUNY Buffalo in the Department of Media Study. Mark C. Marino is a writer and scholar of electronic literature living in Los Angeles. His works include “ a show of hands” (http://hands.literatronica.net/), “Living Will”(http://markcmarino.com/tales/livingwill.html), and "The Ballad of Workstudy Seth"(http://www.springgunpress.com/the-ballad-of-workstudy-seth). His recent work includes Mrs. Wobbles and the Tangerine House (http://markcmarino.com/mrsw/), a collection of interactive stories that he is writing with his children. He is the Director of Communication of the Electronic Literature Organization. (portfolio here: http://markcmarino.com/) He currently teaches writing at the University of Southern California where he directs the Humanities and Critical Code Studies Lab (http://haccslab.com/), a collaboratory exploring the explication of computer source code. When he is not masquerading as Spencer Pratt or Heidi Montag on social media, Mark writes netprov and makes homemade pasta sauce in Los Angeles. Sean Pessin has lived in Los Angeles his whole life. He earned a B.A. and M.A. in English from California State University, Northridge (where he teaches), and an M.F.A. from Otis College of Art and Design. He counts among his projects agape: a journal of literary good will; Magra Books; Red Right Hand Press. His work has appeared in Interfictions Online, The New Short Fiction Series, Liminoid Magazine, and CRAG, and is always fabulous and strange and queer. SA Smythe is a Black genderqueer writer currently living between London and LA, constantly scheming up new ways for us to get free. SA is the publishing editor for THEM - Trans Literary Journal and associate editor for Scarf Magazine. They have poetry published (and/or have work forthcoming) in phren-Z, the nines, Johannesburg Salon, Strike!, and Black Trans Love Is Trans Wealth: An Anthology. Their writing has been featured in Critical Contemporary Journal, okayafrica, and elsewhere. SA also does translation work in six languages and organises in Black queer and trans abolitionist writing collectives around the world. They are currently working on their poetry collection, tentatively titled but do you have reparations money? Follow them on Twitter @essaysmythe.